It’s the Stanley Cup finals, some National Hockey League players have complained about the conditions of the ice rinks. Problems may arise from humidity, leakage, or wrong ice temperatures. 1 The refrigeration technology underlying ice rinks is in fact the same as in refrigerators and air conditioners. How Do Ice Rink Refrigeration Systems Work? To freeze the rink surface, the refrigeration system pumps 9,000 gallons of freezing brinewater through the pipes and on top of the ice-bearing concrete slab. 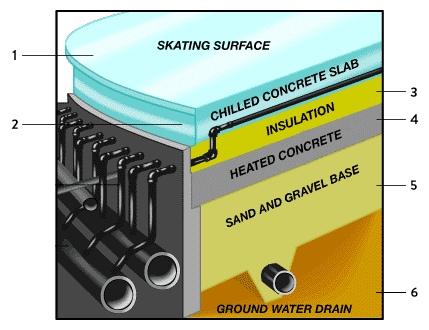 Since the slab sits between the skating surface and the insulation, ice can expand and shrink depending on temperature or time requirements. The brinewater keeps the slab’s temperature just below 32F. Ice rinks used by the NHL must follow strict requirements regarding shape, size, surrounds, maintenance, and temperature. Converting a sports arena into a professional ice rink is quite complex. To make an ice rink, water is carefully released onto the floor to ensure ideal thickness. If it’s too thick, it needs more energy to remain frozen and may get soft on top; too thin and skaters could cut straight through the ice. The process involves several steps, including spray-painting marking and logos. A rink surface will need between 12,000 and 15,000 gallons of water. Ice Hockey – A Workplace for You? If you are a hockey fan or want to work in an unusual environment, you might want to consider using your refrigeration training to work at an ice hockey rink. The refrigeration technology of an ice rink is quite similar to that of other refrigerators or air conditioners, yet your workday may look pretty different.